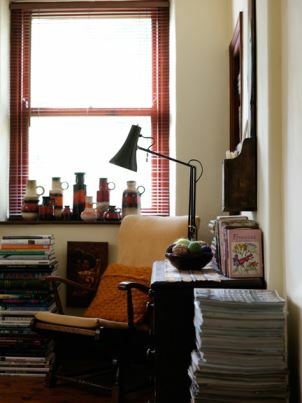 Working from home is a modern trend, with so many of us enjoying the flexibility this brings us especially when managing our own business so why not create a vintage office. This working space had changed much over the years. In the 1930s father would have sat at his desk in a smaller room or corner of the living room but this was only in very affluent homes. Unlike today the lady of the house would not have used this space, nor would the children. By the 1980s homes would make a smaller room downstairs into a working space with a desk in. The telephone would be positioned here so families could at last have some privacy after years of sitting in the hallway. 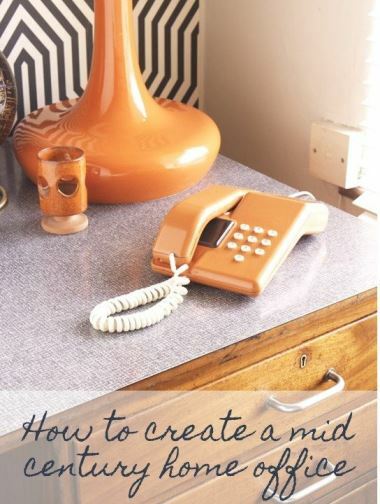 For a vintage desk your best option is to use a dressing table and remove the mirrors. G Plan’s Fresco range in a medium glossy teak comes with two sets of side drawers and a pull out slim line drawer for stationary. The mirror can then be hung in your bedroom or hallway. Alternatively use a bureau with a pull down door to position your laptop on. 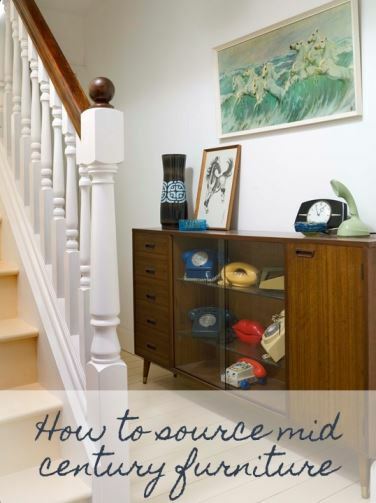 A more easily found solution is a 1960s cocktail cabinet as this also has a pull down door front and an inner light. They come with a lock and key for added security as well as a lower cupboard or drawers. 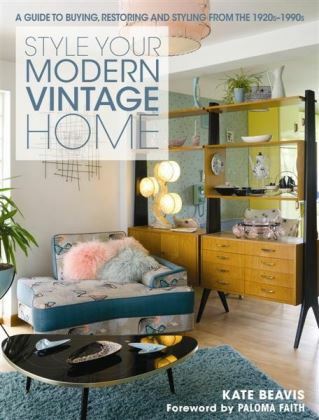 For advice on where to find these key pieces, read my article for Real Homes How To Source Mid Century Furniture. These cocktail cabinets have an inner light which will need to be tested by an electrician before use. Any vintage chair is fine however if you are working regularly you should have a proper modern desk chair as this is best for your posture. 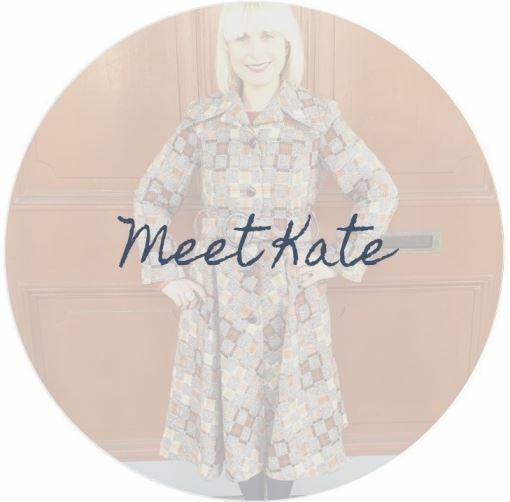 This can be re-covered in a hard wearing vintage fabric such as tweed. This can be done by a professional who can advise on material. Old industrial filing cabinets make fantastic storage in your vintage study. These have often been rescued from old schools, hospitals and factories and come with all the character from decades of use. The slim line, multi drawer cabinets on thin legs with their original handles and label pouches, are great to store all your household paperwork as the drawers are A4. Desktop drawers make great storage for stationary and come in metal or wood. 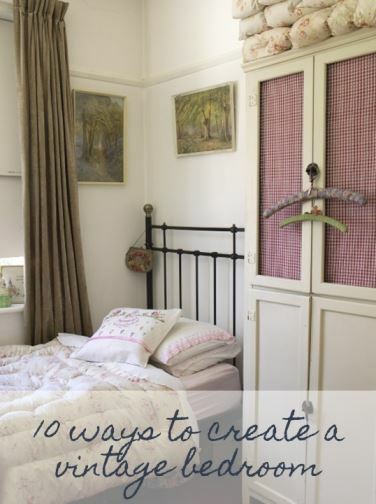 For large storage such as artwork invest in a 1930s plan chest with thin wide drawers. These are often oak and a beautiful piece of furniture in itself. Visit large antique fairs for these key pieces such as Sunbury Antiques Fair held twice a month. These metal drawers are often painted and covered in marks. This in itself can look great for a vintage look but if you want them to be more industrial and polished they can be stripped back to the original metal and given a high shine or painted a new colour. This will take time and effort so be patient and maybe try on a small desk top drawer first for practice. Do this in a ventilated area such as a garage with safety goggles, gloves and respiratory mask. Empty the cabinet fully and lay out on plastic sheeting. If the handles are removable, take them off and store safely. If they are not, then cover with masking tape. Scrub inside and out thoroughly to remove as much surfacerust as possible. Dampen wet/dry fine grit sandpaper such as a 500 grit and sand the whole unit This will need to be done many times using finer sandpaper each time until you get down to the bare metal. Hosedown the unit and wash with sugar soap and warm water. Brush fully with a stiff brush then rinse and leave to dry. If you want a painted finish, spray a fine layer of primer all over. Whentotally dry finely spray paint two layers of your chosen colour leaving it to fully dry between coats. Alternatively, for a high shinesilver finish slowly rub in a metal polish using a soft cloth after cleaning it with the sugar soap. Replace the handles with originals or new to finish. In the early 1930s, the Anglepoise lamp was designed using a newly developed concept of balancing weights using springs and levers. This enabled a light to be angled in any position which was perfect for work and study. The first lamp was made by the British company, Herbert Terry and Sons and designed by George Carwardine, a car designer. First shown at the British Industries Fair in Birmingham in February 1934, this four spring design was an instant hit. However, it took another year for the design to become less cumbersome with one spring less and now aimed at the domestic market. One version was even used throughout World War 2 to provide light for the navigator’s chart table. In the 1950s the design really took off, with the use of lighter steel and franchising the design out to Europe and America. It is now considered a true British design classic, appearing on a set of stamps in 2009 alongside the Mini car and a Spitfire plane. Many retailers have been influenced by their style but there is truly only one Anglepoise lamp and this spring patent has been going strong for over 80 years and can be bought new today. Alternatively, you can find originals online or modern reproduction versions at most lighting retailers. Vintage lights up until the 1980s will probably not have modern wiring. Where possible you should buy a PAT tested light but if you are in doubt get your retro lights checked by a qualified electrician. Every desk in every vintage office needs a clock to remind you it’s time for lunch! The Big Ben clock by Westclox makes a great addition to your workspace. Westclox started its life as the United Clock Company in the late 1800s in Connecticut, USA. After a few bankruptcies they reformed as the Western Clock Manufacturing Company and designed the Big Ben alarm clock movement. This had an integral bell at the back and was famous for being the first alarm clock as early as 1910. Since then they continued to revolutionise alarm clocks, being the first to design the snooze mechanism in 1959. The 1970s Repeater model made in their factory in Scotland has the classic space age styling with its silver tulip base and coloured dial. While traditionally a bedside clock this won’t look out of place in your modern vintage study. 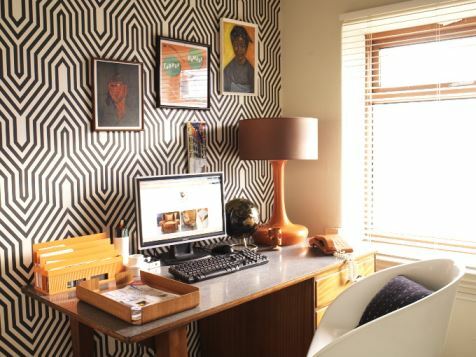 Create a feature mood board wall full of design images to inspire you while you work. This could be a large magnetic board or a hand painted black board. Cut out images from magazines, print off photos…the list is endless. 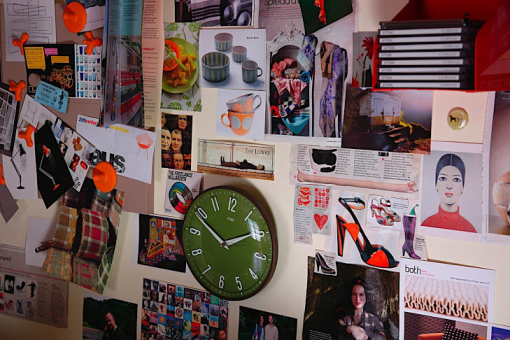 I love this wall belonging to Justin and Adelle from H Is For Home as it is colourful, fun and slightly haphazard. The vintage green kitchen clock in the middle adds a touch of practicality and draws your eye centrally, breaking up the images. 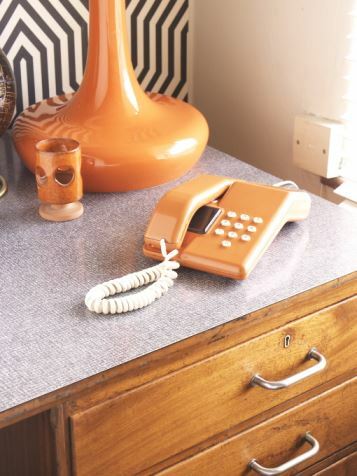 Finish off the space with more vintage accessories such as a perpetual calendar, phone, ink well or a retro desk top calculator. 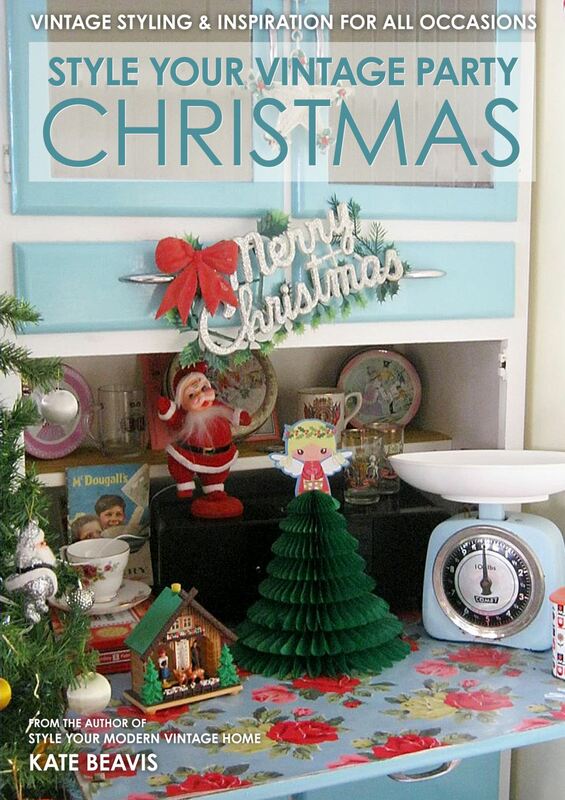 These can be found from online shops such as H Is For Home and Planet Vintage Girl or at fairs such as The Vintage Home Show.